Fleetwood Town head coach Uwe Rosler is targeting a minimum of one midfielder when the transfer window opens next week – but says the club can only go shopping if they offload. Rosler has been rocked by injuries to Kyle Dempsey (leg wound) and Jimmy Ryan (foot) as well as the long-term absence of Martyn Woolford (knee ligaments) in recent weeks. Town, who are eighth in the League One table as they prepare to host bottom club Oldham today, do expect to have George Glendon’s loan from Manchester City extended beyond January. 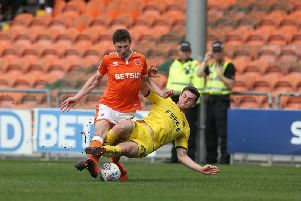 Town’s boss is, however, pleased with the hard work and positive attitudes of those players who may not have featured as much as they’d like so far this season. He said: “In the end everyone wants to play football and the guys who have not played as much minutes as they would have hoped, obviously they feel probably a little bit frustrated but it didn’t affect their work ethic in training. And Rosler hopes the club continues to pull in the right direction in 2017. “Everybody tries to make the football club better and I think that is my biggest wish; that we continue on that way and obviously that will affect every part of the football club,” he said.